Gas Carburizing Service adds carbon to the surface of parts to achieve a very high surface hardness. For most materials, the subsurface becomes a tough & ductile core. Carburized depth (case hardened depth) can be increased with either time or temperature. A quality heat treater will determine the proper processing parameters to achieve the desired properties at minimal cost. Gas Carburizing Surfaces adds carbon to the surface of parts to achieve a very high surface hardness. For most materials, the subsurface becomes a tough & ductile core. Carburized depth (case hardened depth) can be increased with either time or temperature. A quality heat treater will determine the proper processing parameters to achieve the desired properties at minimal cost. - Energy and space saving rotary type continuous heat-treating furnace. Fully automated process on turntable drive. Pune Metal Treater offers Carbonitriding in Pune. Carbonitriding is a modified form of gas carbonizing. Fundamentally the process varies from carbonizing by the additional introduction of ammonia into the carbonizing atmosphere. Nitrocarburizing is a shallow case variation of the nitriding process. 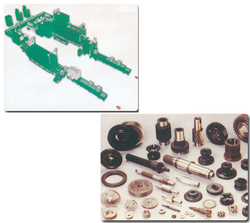 This process is performed to provide anti-wear resistance on the surface layer and to improve fatigue resistance. White layer thickness up to 20 microns can be provided. Please check with us for higher layer thickness. 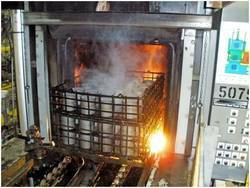 Nitro carburizing is a shallow case variation of the nitriding process. This process is performed to provide anti-wear resistance on the surface layer and to improve fatigue resistance. White layer thickness up to 20 microns can be provided. Please check with us for higher layer thickness. We are the leading Service Providers and Job workers for Precipitation Treatment Services in the following Areas Coimbatore, Erode, Tirupur, Hosur, Chennai, Madurai, Trichy, Salem and fother Tamilnadu Region., we can also do the services in the region of Karnataka, Andhra Pradesh and Kerala.